A small - or possibly fairly sizeable - bomb may be about to explode in the heart of UK retailing. In the wake of the revelation that Tesco, the country's biggest grocer, had overstated its latest profit warning by a cool £250m and the reported suspension of several of its top executives, there is a strong likelihood that the company may have to face some very tough questioning. And so may some of its competitors. Adrian Bailey, Chair of the UK parliamentary Business Committee has been quoted - in International Business Times - as saying that "We may well as a committee want to look at this. Not just at Tesco but at what is going on in the retail industry and in the relationship with the suppliers to see if the issues we came across two years ago are still there." There are very few wine suppliers who would say that Britain's supermarkets no longer apply 'undue pressure' on the companies with whom they deal. Indeed most freely admit that they would greatly prefer to sell to the German discounters Aldi and Lidl, than their UK counterparts. As one said to me recently "The discounters drive a hard bargain but you know precisely where you are with them. They buy what they say they are going to buy, for the price they agree to pay". Most analysis of the differences between the discounters and the established UK retailers have reasonably focused on the former chains' smaller outlets, more limited ranges and service levels - and lower margins. What few have mentioned is the fundamental philosophical gap between working practices of the two groups. The discounters, despite their size, are little different from any corner shop or market trader: they buy stuff and then sell what they have bought. Compare this with the model now applied by Britain's biggest supermarket chains - including the middle class darling Waitrose, and you might be looking at two sets of political parties, so wide is the difference between them. Coopbury, Asdrose and Morisco et al rely for part - often a big part - of their income on a wide range of payments that have little or nothing to do with the simple business of buying and selling. Some of these payments are more voluntary than others. It was to handle the involuntary ones that a Grocery Code was established last year, along with a Grocery Code Adjudicator (CCA) in order, in the words of Farmer's Weekly magazine, 'to tackle unfair supermarket buying practices'. According to a July 2014 report in that same publication, last June's GCA annual conference revealed that "80% of suppliers had experienced an issue with a retailer, but only 23% would consider giving evidence. Fear of retailer retribution prevented 58% of respondents from raising issues, while 40% worried the GCA would be unable to do anything." Where the GCA has been involved, it has actually proved to be effective. Tesco apparently 'retracted requests for shelf-positioning payments' after evidence was brought to the GCA, while 'The Co-operative stopped asking suppliers to “compensate” it under joint business agreements' after the adjudicator was informed. Uncovering these practices was not easy, however. It apparently involved 'forensic auditing (retailers trawling communications to find ways to claim money from suppliers)'. Following the recent revelations, it seems fair to imagine that Tesco is about to be the target of rather a lot more forensic auditing. 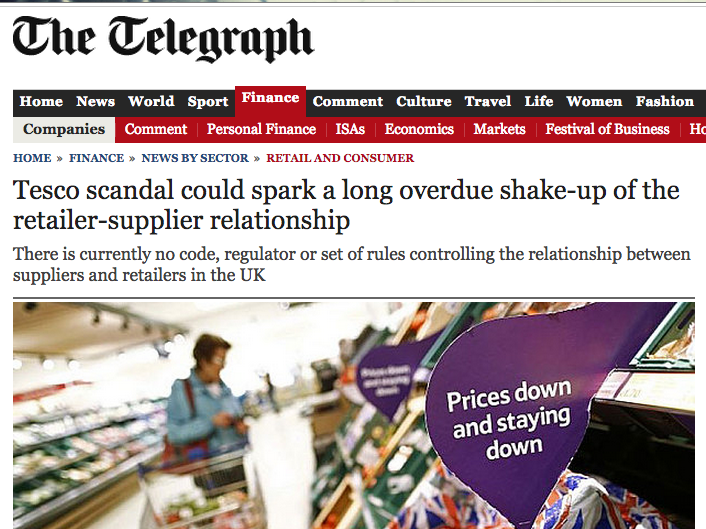 Successful GCA-mediated cases are rare because, as Graham Ruddick wrote in yesterday's Daily Telegraph, "Many suppliers are too scared to speak out against a larger retailer for fear of being delisted or replaced by a rival, so they suffer in silence and agree to the unreasonable demands being placed on them." Ruddick lists a set of recent instances that serve as an indictment of the way retailing in general is conducted in the UK, and the regularity with which retailers renegociate deals they have already agreed. In 2013, "Debenhams demanded a one-off fee - a rebate - from suppliers worth 2.5pc of its outstanding payments and said it would apply a 2.5pc discount to orders it had already agreed with suppliers" while, general retailers Argos and houseware specialists Homebase "applied a 2pc rebate to future orders". John Lewis, parent to Waitrose and every Briton's model retailer, "told suppliers last year they would be subject to a rebate of up to 5.25pc on annual sales". In May, motoring accessory retailer Halfords sought to fund a £100m turnaround plan with help from one-off payments by its suppliers amounting to up to 10% of the cost of their annual sales to the retailer. In another Farmers Weekly article, readers are warned against retailers tracking their - the farmers' - profits and using them as a basis for rebate demands they want to levy. In another context, this would sound very like the kind of protection racket operated by the Mafia. The law has a way of dealing with gangs who threaten businesses with violence as a means of exacting cash, but it also sanctions businesses who abuse their employees. A boss can't simply demand that his workers hand over a percentage of their agreed wage in return for a - still uncertain - measure of job security. Whether or not the world's wine suppliers will ultimately benefit from the fallout from the Great Tesco Profit Warning Scandal of 2014 remains to be seen, but I'll bet that a couple of German retailers are already raising a glass or two of celebratory good-but-very-inexpensive Sekt.